For the longest time, Carla and I have been wanting to dine at Epcot’s Coral Reef Restaurant. Tucked away over in The Seas pavilion, the notion of dining “under the sea” has been interesting to us. And of course, to Anna. Oddly though, we have never made our way to Epcot’s only real seafood restaurant. However, we finally managed to make it to Epcot’s Coral Reef on a recent trip to Disney World. 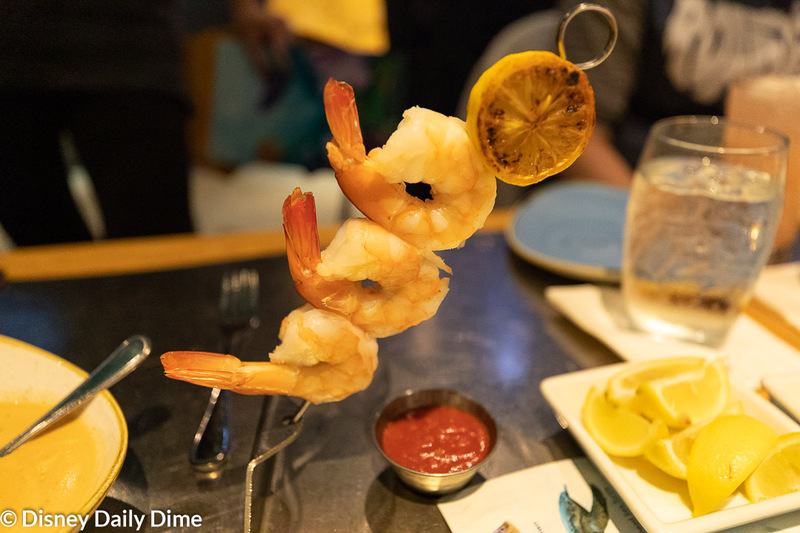 Here in our Coral Reef review we’ll talk to you about our thoughts on the food, ambiance, theme, service and anything else that comes to mind. It will weigh heavily on some of the theme because Coral Reef may be one of the most unique experiences in Epcot. How often can you dine next to a giant sea turtle or a sting ray? But we’ll circle back to that in a minute. 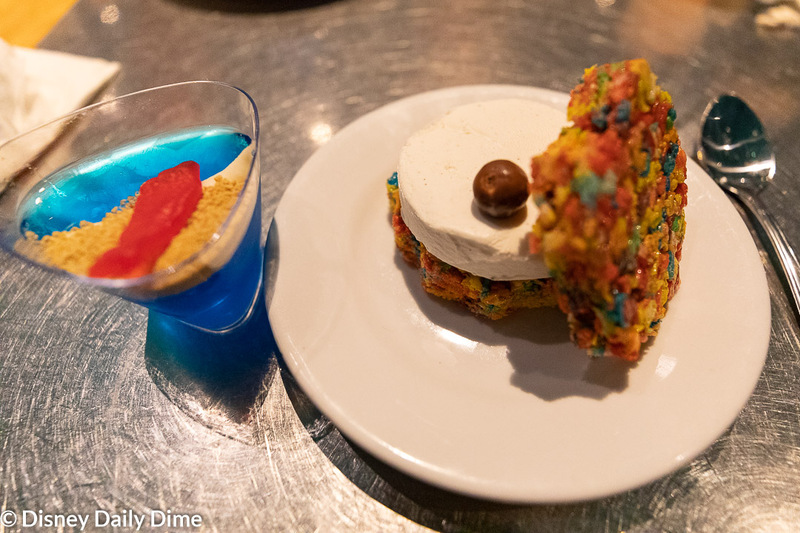 As far as some basics of associated with Coral Reef, it’s a table service restaurant that will run you 1 credit on the Disney Dining plan. Depending on what you order, this could be a good to great value on the dining plan. Pick the $40 lobster, a drink, appetizer and dessert and it’s worth the table service credit. As with all things dining plan related, you need to research it and see. On this particular day, we booked our Coral Reef Restaurant reservation as part of a Candlelight Processional dining package. This allows you to skip the crazy standby line for Candlelight Processional, which may be helpful if you really want to see a specific presenter or don’t want to get in line hours in advance. However, the dining package increases the cost to two table service credits on the dining plan. We think it is worth it, but you’ll have to decide for yourself. One last quick note. On this particular trip we actually had Carla’s parents with us, so you’ll get to see a few more dishes than normal. From a theming and ambiance perspective Coral Reef is an immersive experience. With one wall that has huge windows that look into the aquarium, you get a beautiful view of various sea life. In our opinion, this is the major draw of the restaurant. Finding yourself dining while watching the sea life is a great way to experience something different and unique. When you’re paying some of the prices you find at Disney World, we put a premium on that aspect of eating. It’s one of the reasons we’re not overly big on Le Cellier, but love Sanaa. As it relates to the view of the aquarium, the closer you can get to the windows the better your experience will be. In this particular meal, we sat in the middle tier of seats. The view from the third and furthest back row isn’t all that great, in our opinion. When you get to Coral Reef you can ask for a table along the glass, however you should be prepared to wait for it. We did not do this on our trip as we had just gotten to Disney World this day and headed right to Epcot. We were hungry and a little tired, so waiting wasn’t high on our priority list. Next time, we’ll ask for a table on the glass. One thing I really liked as it relates to the theming of Coral Reef Restaurant is how they tried to bring you into the water. 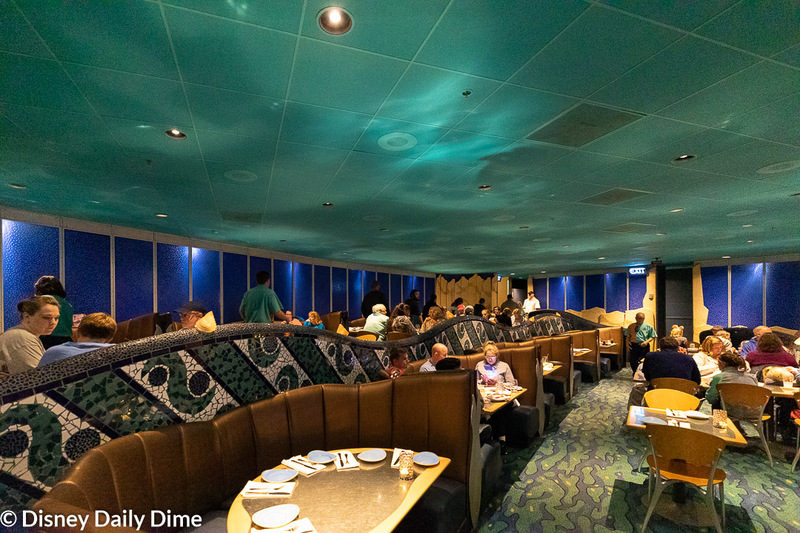 If you look at the wider pictures of the restaurant, you’ll notice that the ceiling is an aqua blue color that is meant to simulate having water all around you. To enhance that feeling, the touch I liked the most was how Disney bounces light off the ceiling making appear as the sun is shining down through the water you are “immersed” in. It was a really nice touch that sort of transfixed me through the meal. 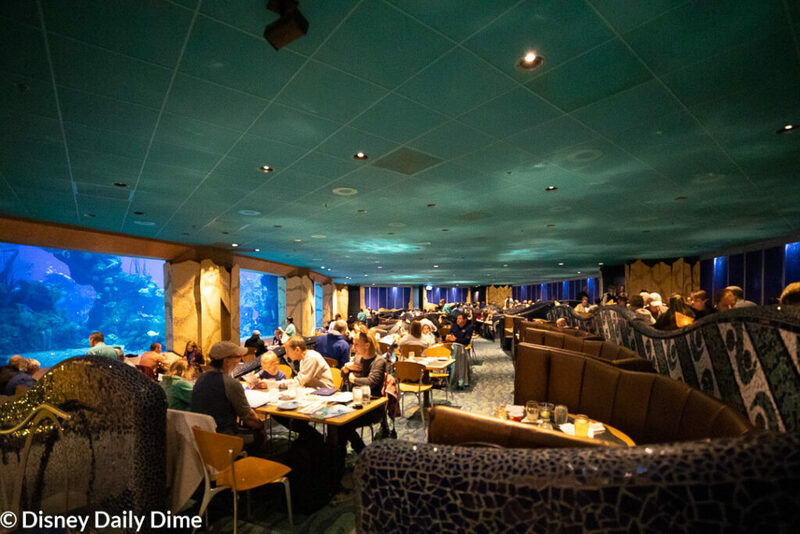 We feel that the experience of dining where you can see into the “sea” is what Coral Reef Restaurant is all about. It’s a great theme and atmosphere. There were some other issues though. 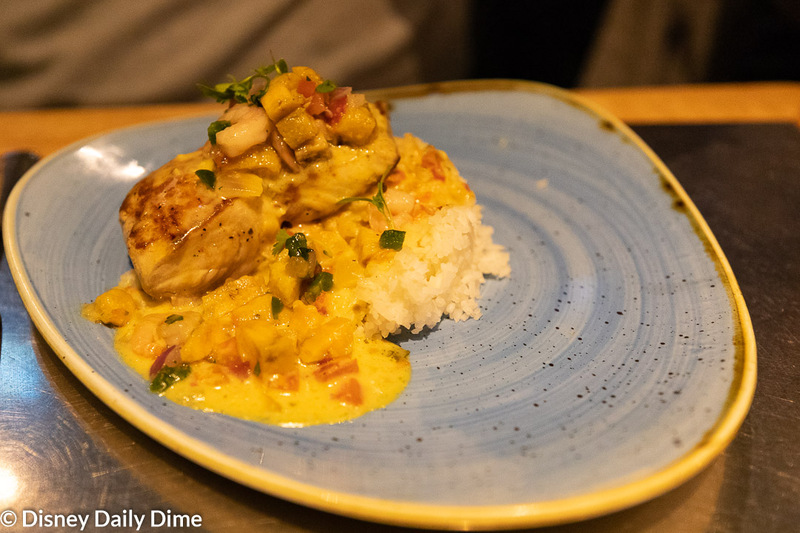 While Coral Reef only requires the use of one table service credit, the prices you’ll find on the menu would indicate it’s a higher end level of restaurant within Epcot. Because of that we were expecting good service, but had read some of the other reviews saying that service here has been a mixed bag. Fortunately for us, we found the service to be very good. Our waitress was very attentive, in spite of the restaurant being very busy. She was very patient with the girls, which is saying something on this particular evening. Anna was recovering from a rough day of travel and tiredness, which made her a bit cranky. In addition, she was very attentive to Carla’s gluten free needs. She even went to make sure the Grapefruit Spritzer was gluten free. We can’t say that we’ve had too many experiences where the servers would check on the drinks for Carla. The only service issue we had was the food temperature. A few of the dishes came out lukewarm. We aren’t sure if that was an issue with the server not picking up the food quickly or if the kitchen undercooked it. We’re inclined to think it was undercooked for reasons we’ll highlight below. As we said earlier, we had Carla’s parents with us on this trip. Between that and booking the Candlelight Processional dining package which came with an appetizer, entrée and dessert for everyone, we ordered a lot of food. So, get a good cup of coffee or whatever you like and settle in! 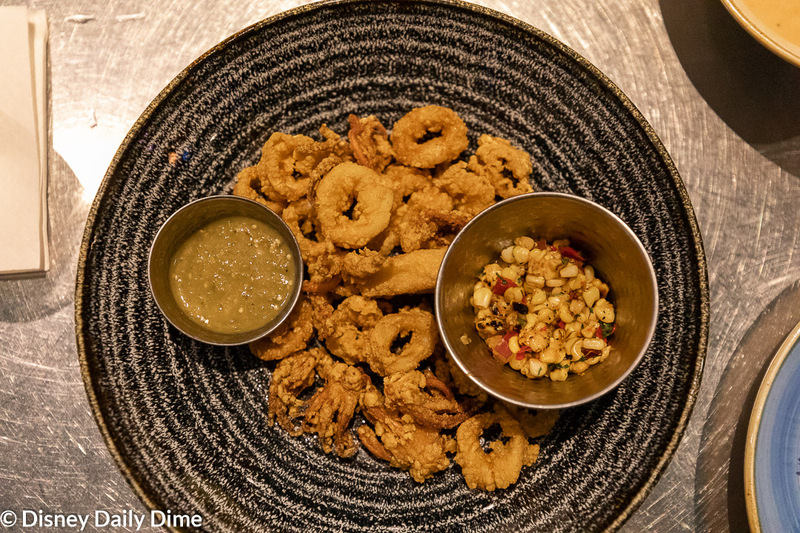 The first appetizer from Epcot’s Coral Reef Restaurant that we want to highlight is the Crispy Rhode Island Calamari. It was cooked well and had a nice crunch to it. However, what really made this unique to us was the sauce that came with it. As you can see it isn’t your typical marinara on the side. This had a roasted corn relish and tomatillo sauce served with it. The tomatillo sauce was had a great flavor and provided some slight heat. It made the calamari feel new and different. I will note Carla had a gluten free version of the calamari, but we’ll cover that in more detail in her gluten free Coral Reef review. Next up is the spinach and ricotta ravioli. 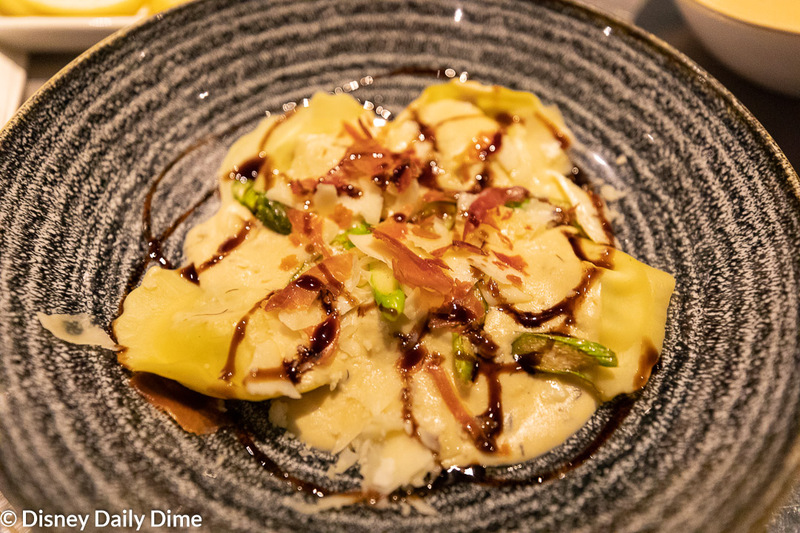 The ravioli is complimented by baby asparagus, prosciutto chips, and a balsamic glaze. The ravioli itself was great and the prosciutto was a nice touch to pick up some saltiness. If we had one issue it was the balsamic glaze. It was a little heavy handed in our opinion and would drown out the other flavors from time to time. Otherwise, it was a quality dish. The lobster bisque was the low point of the appetizers for us. To be honest, I’m not sure what makes it “lobster” bisque as there weren’t really any bits of lobster to be found in here. Not that I need a whole tail chopped up, but there was not a single chunk or small morsel that I could find. The bisque was creamy and but I found the flavors a bit muted. For the last appetizer at Coral Reef Restaurant in Epcot, we had the colossal shrimp cocktail. I’m not exactly sure what makes it colossal other than the fun little way the present the dish. But three shrimp isn’t exactly the largest shrimp cocktail I’ve ever seen, but I digress… The shrimp itself was cooked well and the cocktail sauce that came with it was your average cocktail sauce. If you like shrimp cocktails, this will do. Not overly innovative or different, but not sure how much you can do with a classic appetizer like this. 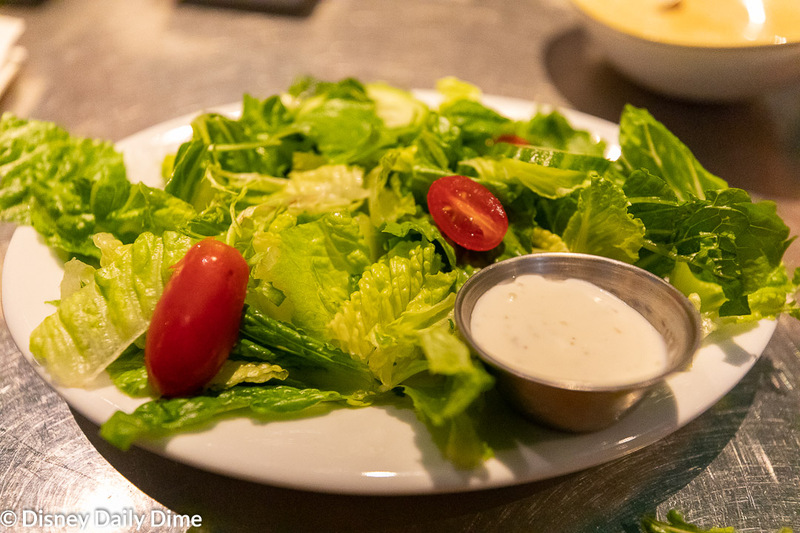 For their appetizer at Coral Reef, Anna and Elsa both selected a basic salad. You can see it above. Nothing really to write home about, it was lettuce and ranch dressing, which is right up Anna and Elsa’s alley. 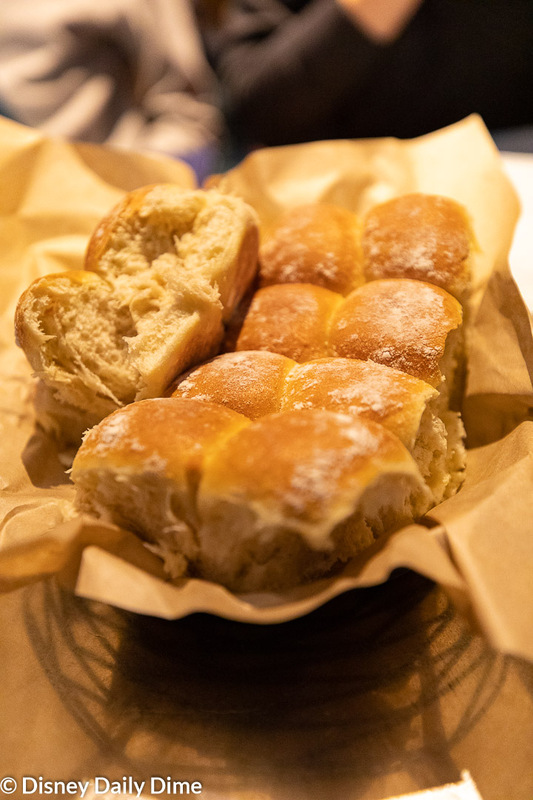 In addition to the above appetizers, the meal comes with a fairly simple bread service. The rolls aren’t the best free bread you’ll find around Disney World. We’ll save that honor for California Grill right now. However, they were still warm and fresh rolls that certainly make me salivate thinking about them while looking at the picture! 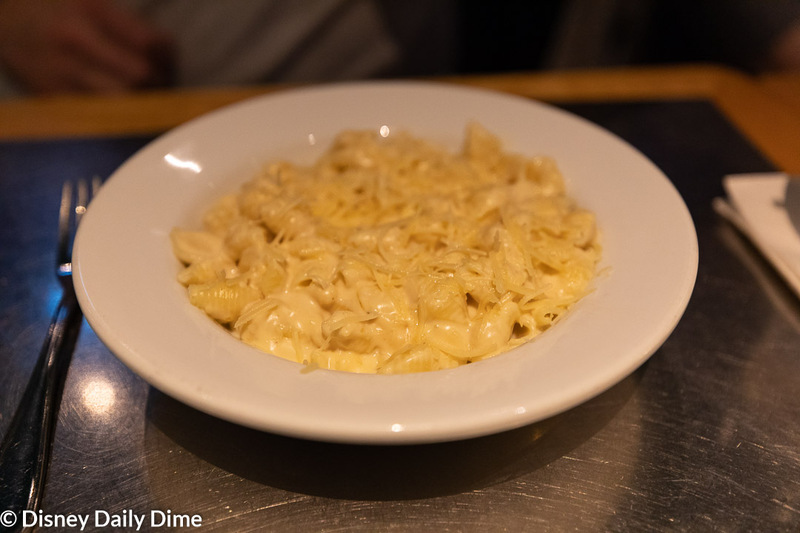 When it came time to order, Elsa decided to try the pasta with parmesan cream sauce. In terms of the kids menu at Coral Reef Restaurant, it was probably the best choice for her. Though I will say she was quite disappointed that they didn’t have sushi after our wonderful experience at Morimoto Asia. This is a seafood restaurant right? We still have some work to do teaching the girls differences in restaurants. Elsa devoured this meal. It was as creamy as it looks in the picture and the parmesan flavor is something she really enjoys. One thing you won’t see with her meal are any healthy sides. For some reason, we let her order two desserts. Parenting fail right there. I’m not sure what we were thinking. Carla’s Note: We were tired and it was a treat for the first night of the trip. 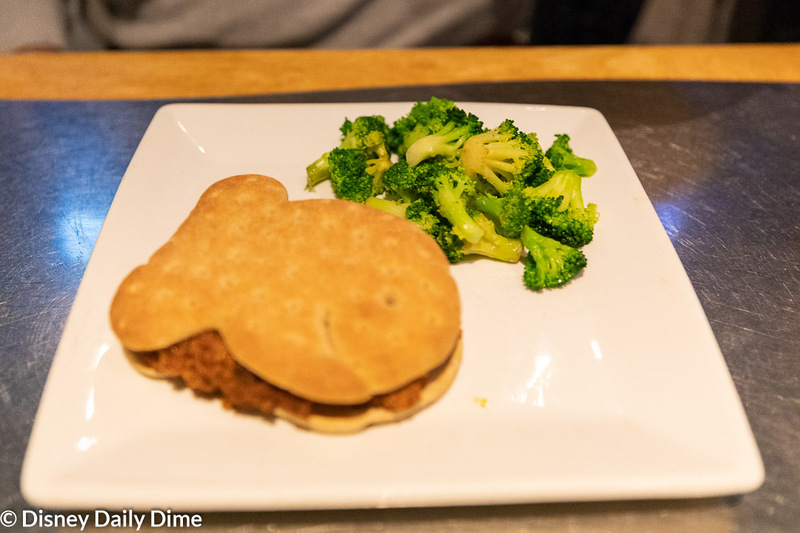 For her kids’ meal, Anna order the turkey sloppy joe. To say that she did not enjoy it would be an understatement. Honestly, I’m kind of glad that the picture above is sort of blurred out. It looked pretty disgusting. The little fish shaped bun is fun, but that’s about the best thing we can say about it. Anna did enjoy the broccoli, but she’s a fan of it in general. When it came to the adult entrees, we had a whirlwind of different experiences. Daisy (Carla’s Mom) ordered the seared Mahi Mahi. This was a phenomenal dish. The flavors from the coconut and cilantro-lime sauce blended so well together. That’s coming a person that isn’t a coconut person. 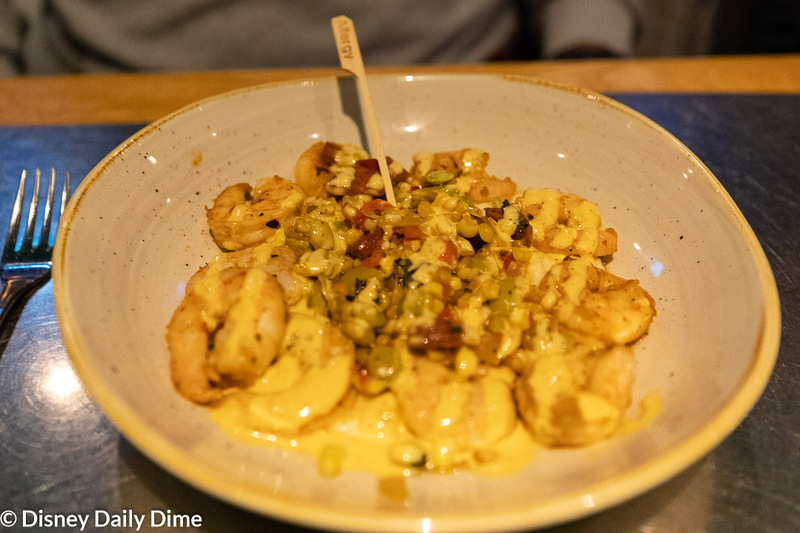 Topped with the Caribbean shrimp salsa, the whole dish worked well together. We all agreed this was the best entrée that we ordered for the table. Next up is the salmon that Donald (Carla’s Dad) ordered. The seared sustainable salmon filet was good, but I wouldn’t call it outstanding or creative. 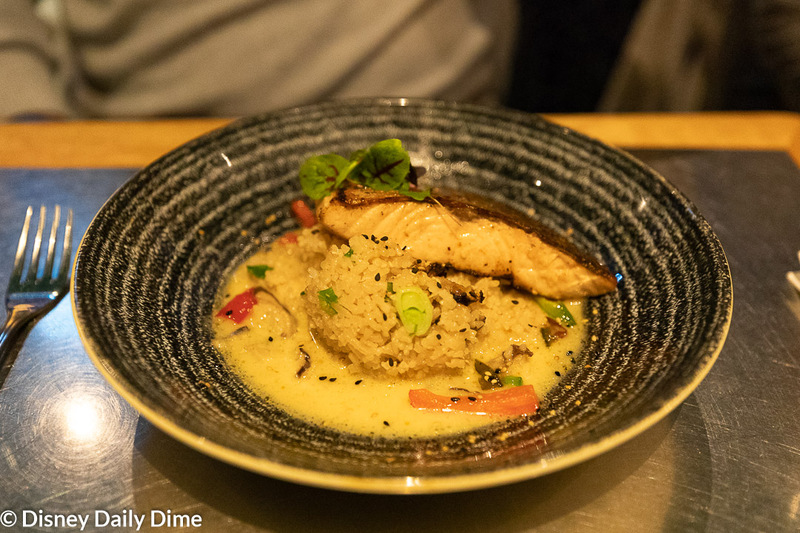 Blackened, it was served sitting on a bed of rice and topped with a soy-lemon grass beurre blanc. The salmon was cooked well, but the flavors from the sauce were just kind of okay. Carla ordered the shrimp and grits. We’ll save most of her comments for the more complete gluten free review. Carla found the shrimp to be cooked well, with a small hint of spice to them. 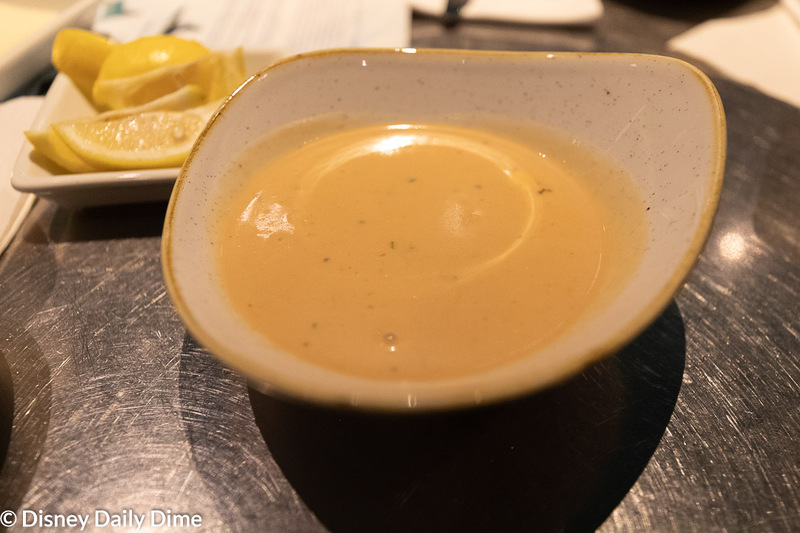 The spice comes from the creole spice emulsion. The grits had a good flavor, but nothing overly notable. Her biggest issue with the dish was that when it came out it was lukewarm. Not exactly something you’re looking for when eating a meal. For my meal, I decided I may as well try to maximize my dining plan credits at Coral Reef! I went for the whole lobster. So, let’s start with the good. The lobster was actually a stuffed lobster. I found the stuffing had a nice texture with some crispiness on the outside and was soft on the inside. The béarnaise sauce that topped it was a great complement to the stuffing. It all went downhill from there. The potatoes were bland and the asparagus was overcooked. The asparagus was some of the limpest I’ve seen in a while. Now, I like my asparagus crunchy so this could be a matter of personal preference, but it was borderline mushy. But I can get past most of that. What I couldn’t get past was the fact that part of my lobster was still raw. The main tail was cooked fairly well. I found the very tip of the tail to be slightly undercooked. What was not cooked well were the claws. I found them almost raw to the point of not being edible. When I cracked them open you could see water rushing out and the limp uncooked meat in a stringy mess. It was very disappointing. I’m honestly not sure how the claws could be so raw given the tail being largely cooked. Maybe I’ll try it again someday to see if the dish is better then. 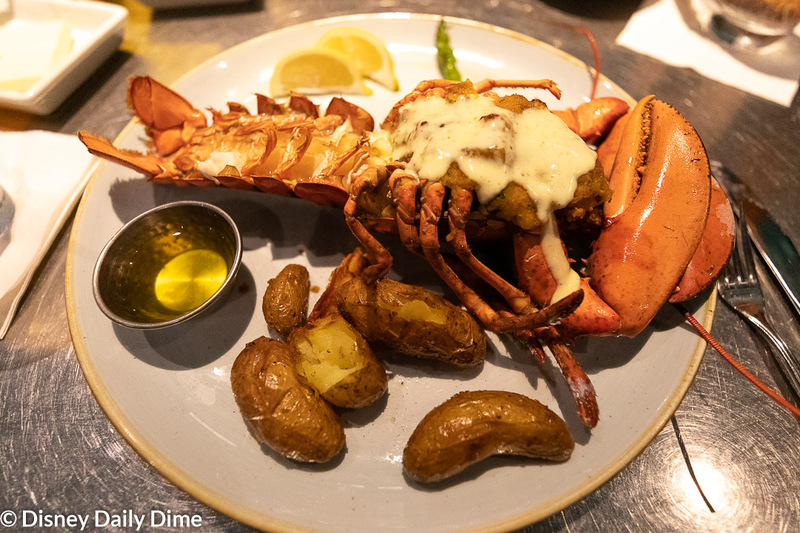 If you’ve had the lobster before, I’d love to hear your experience down in the comments below. 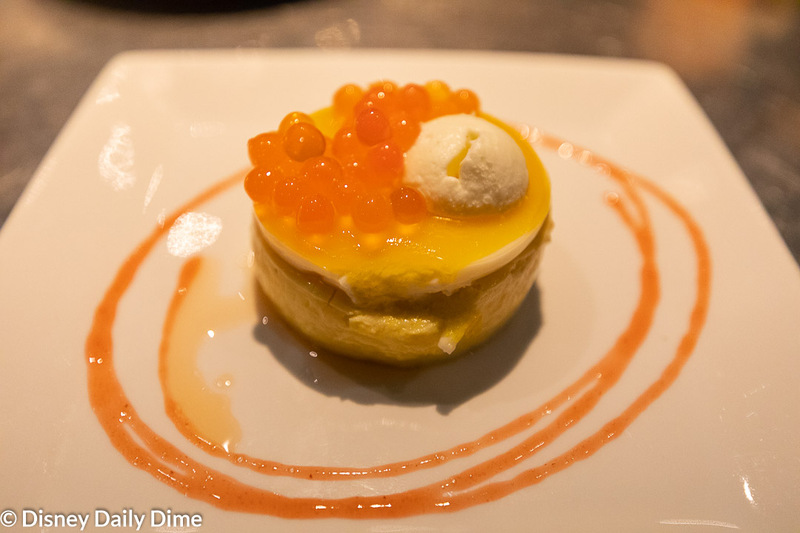 In the picture above, you will see the key lime tart that Daisy ordered. The key lime portion of it was excellent. However, she was very put off by the Boba Pearls that topped the dish. There was too much going on as the tart also had a strawberry cream sauce and tropical fruit glaze. The dish probably would have worked better for her had it been more straight key lime pie. Next is the turtle cheesecake that Donald and I both ordered. Here’s another instance of too much going on with the dish. Fortunately, this was easier to deconstruct. 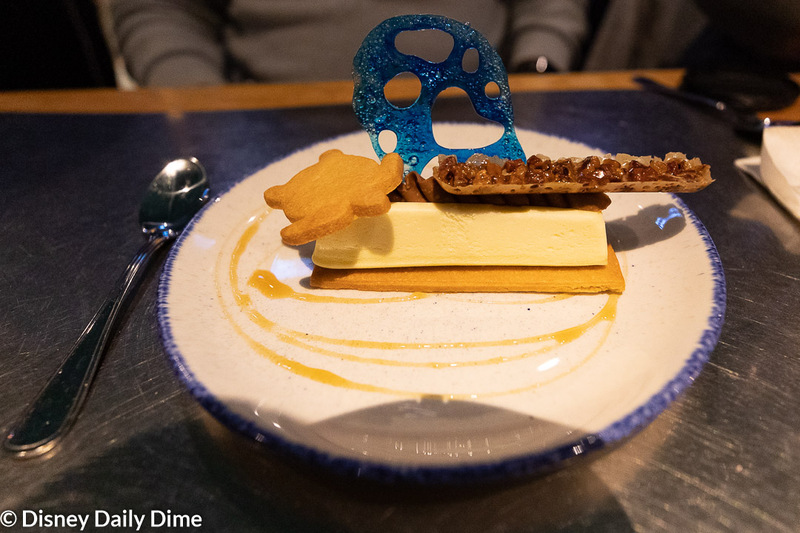 The blue crystalized sugar wave was visually cool, but not necessary for the dish. It was just sweet and I barely ate it. Anna didn’t hesitate to devour it though. I’d say the same thing for the turtle cookie. They were both decorative touches that didn’t add to the dessert. Beyond those aesthetic issues, the cheesecake itself was a nice thick cheesecake. The pecan florentine added a nice crunch to the cheesecake, while the chocolate-caramel ganache was a wonderful topping for every bite. This was a great dessert that we would both recommend. For Carla’s dessert she had Coral Reef’s classic chocolate wave. Because it is made from flourless chocolate cake, it is naturally gluten free. In her words, “It was fabulous”. She found the chocolate to be a quality dark chocolate and not overly sweet. 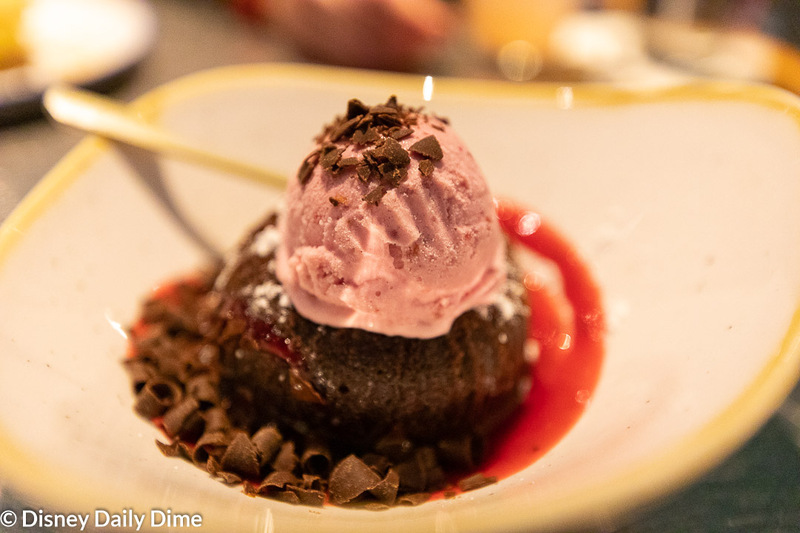 The raspberry gelato on top was a perfect match for the chocolate. Lastly, you can see the two sides Elsa ordered: the Coral Reef ice cream sandwich and the sea breeze gelatin cup. Like I said, parents of the year right here! While they are visually interesting because of the amount of color, Elsa didn’t actually eat too much of them. The Coral Reef ice cream sandwich was really big and hard for her to eat. She found the gelatin cup was just plain. Not much flavor and kind of boring. As we said in the early part of this post, Coral Reef Restaurant is a place that you’re really coming to for the unique dining experience. 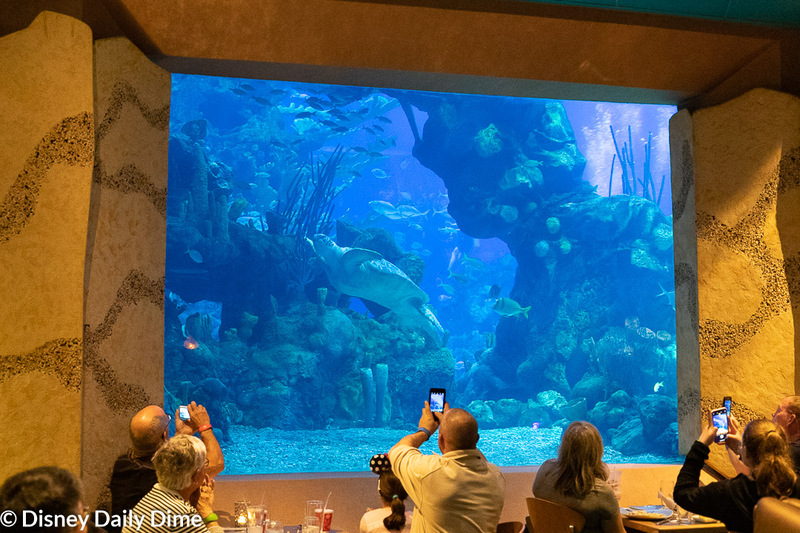 Being able to watch the aquatic life in the aquarium while you dine creates a relaxing and beautiful atmosphere. Anna and Elsa loved that aspect of the meal. Heck we all did. We will say if you are going to dine at Coral Reef restaurant in Epcot, make sure you get as close to the glass as possible. The third-row view just isn’t worth it in our opinion. Ask to be seated against the glass or at least be on the second row. I’d be disappointed to be all the way in the back of the restaurant with a limited view. It is THE reason to eat here, in our opinion. What we have mixed feelings on is the food. Yes, there are some good dishes at Coral Reef, but there are also some that you may want to avoid. We’ve also seen plenty of reports of the inconsistent food, so it is probably not an isolated experience. We’ll definitely be back to give it another shot, but just know that the food can be hit and miss. I think there are some staples that if you stick with, you’ll be pleased with your meal. With that, we’ll wrap up our Coral Reef Restaurant review. This Epcot based restaurant provides one of the most unique dining experiences in the entire park. And that’s saying something given all the options you have over in World Showcase. 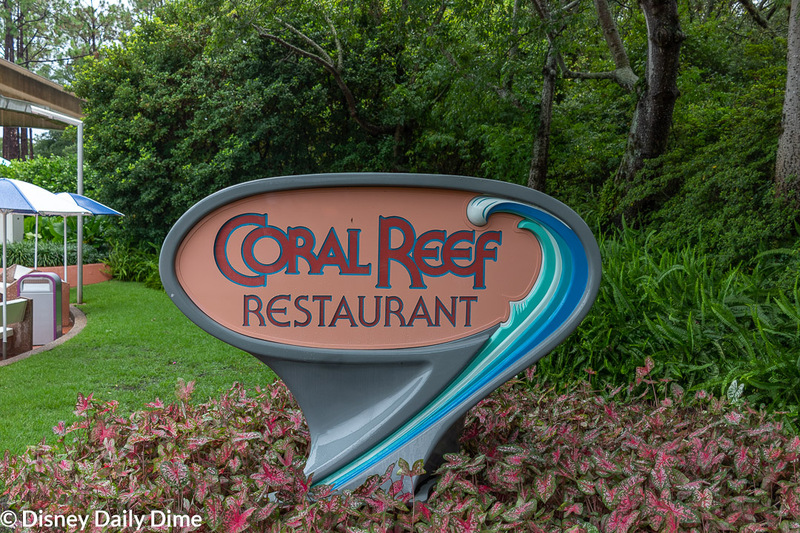 If our Coral Reef Restaurant review was helpful, or at least entertaining, please like and share this with your friends or anyone you think will find it useful. Just use the sharing buttons on the page. We always appreciate it when you share our posts, as it allows us to spread the word about our blog and hopefully allows us to help others.